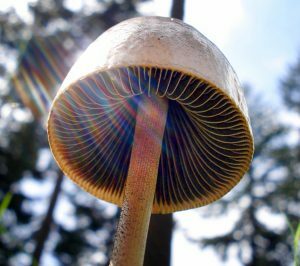 Paul Stamets in his mycological bible Mycelium Running writes that “Mushrooms can be placed in 4 basic categories: saprophytic, parasitic, mycorrhizal, and endophytic, depending upon how they nourish themselves,” pointing out that many deploy a mixture of all these strategies. The woodlands blog has featured the mycorrhizal types such as the Fly Agaric (Amanita muscaria) that derive their energy by forming mutually-beneficial relationships through extending the root systems of trees and other plants. Both parasitic and endophytic types sustain themselves by living on or within other organisms, be they plant, animal or whatever, the former to the detriment of its host, the latter harmless and sometimes even beneficial. 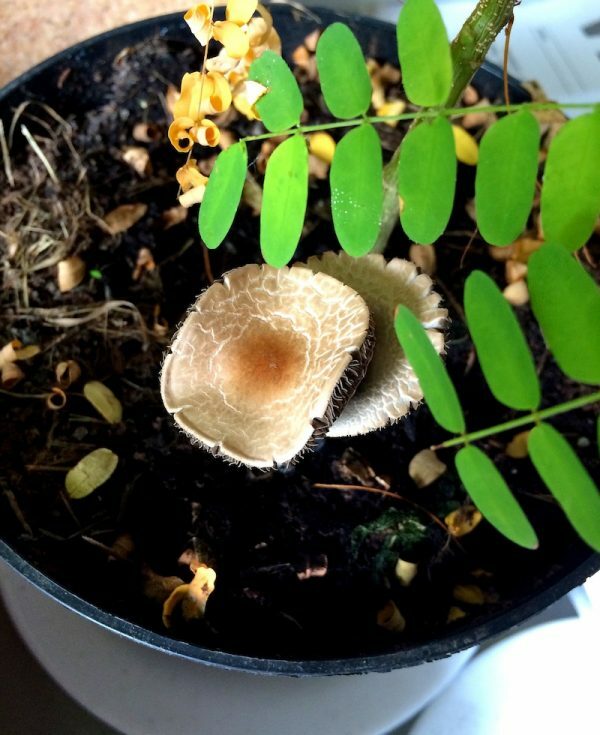 The pathogenic Honey Fungus (Armillariam sp.) is a good example of a parasitic type, while the relationship between Tar Spots and the leaves of the sycamores and acers that they appear on is best described as endophytic. But most of the macro-fungi (i.e. those visible to the naked eye) can be considered “rotters”, or saprophytic. They play a vital role in decomposition, by breaking down organic matter into chemical compounds they can utilise. This they do by exuding acids and enzymes from the mycelium that comprises the main part of each organism – that is the expansive network of branching, filamentous threads known as hyphae, not the more visible fruiting bodies, the “mushroom” or “toadstool”, that we identify them by – in order to externally digest and absorb nutrients such as minerals, sugars, amino acids and peptides into their tissues. In this respect, they are closer to animals than plants in that they do not photosynthesise to produce their energy, but ingest food from outside sources. Without fungi, we would be armpit deep in leaf litter, twigs, dead animals and even less savoury natural debris. 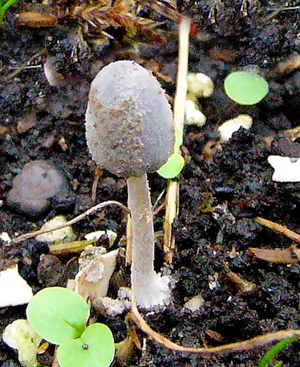 The saprophytes, too, can be divided into the two categories of primary decomposers and secondary decomposers. The first type immediately move in to begin the process of decay whenever a leaf drops, a tree falls, or an animal gasps its last. The second, of which last month’s Candlesnuff Fungus (Xylaria hypoxylon) provides a good example, continue where the primary rotters left off, and you’ll often see them growing together. Fungi are not the only organisms involved in primary decomposition, as anyone who has studied their compost heap will be aware. Bacteria, worms, slugs, insects and a host of other creatures all play their part in breaking down organic matter. 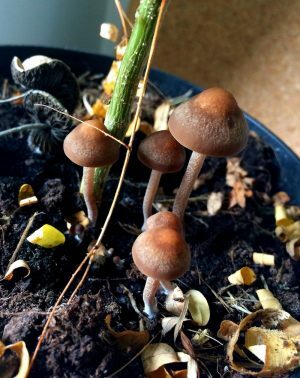 Nevertheless, across the year you may well see various fungal examples of secondary decomposers popping up in your compost, on wood chippings or in plant pots and terrariums. One of the most dramatic of these is the bright yellow gilled mushroom Leucocoprinus birnbaumii, also known by the common names of Lemon-Yellow Lepiota, the Flowerpot Parasol and Plant-pot Dapperling, due to their prevalence in greenhouses, grow-bags and around house plants. 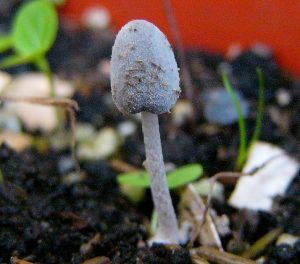 This small (around 2-4cm heigh) scaly exotic-looking mushroom grows from spores that might have arrived in commercially bought compost, or might be floating after being released from other plant pots in the vicinity, perhaps imported from a sunnier clime. They will cause no harm to your plants anyway, although they will cause harm to you if you are foolish enough to try making a meal out of them. In other words, there’s no need to get rid of them, because they are a pretty decorative addition to any plant pot. There are many examples of Leucocoprinus, although with about 40 species in the genus (and various sub-species), they are not all so easy to identify exactly. 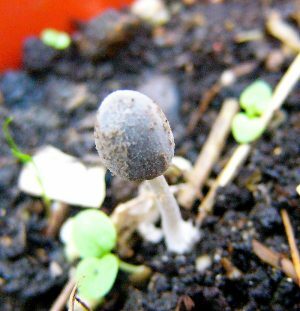 The one depicted here that sprouted in the home-made compost in which I was growing tomatoes might be Leucocoprinus lilacinogranulosus, which Gerrit J. Keizer’s The Complete Encyclopedia of Mushrooms describes as “conical to campanulate to expanded with obtuse umbo, 2-4 cm, matt, with fibrillose, pink to lilac scales on a whitish to cream background”. 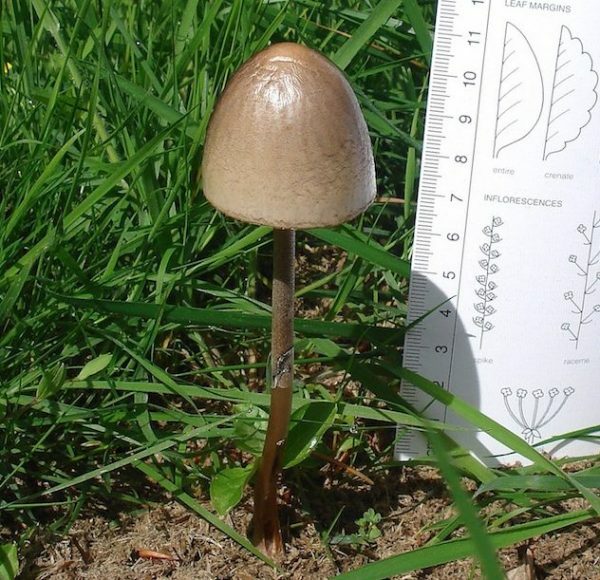 However, in my picture there is no ring visible around the stem as described – a good example of how tricky it is to identify the many mushrooms you might found growing all over the world. From the photographic evidence provided, it might just as likely be Coprinopsis cinereofloccosa, or any number of other species,. One thing we can say is that Leucocoprinus lilacinogranulosus is certainly a non-native species. It was first described in 1898 from a specimen found in the Botanic Garden in Berlin (opens a pdf file), presumably of foreign origin. 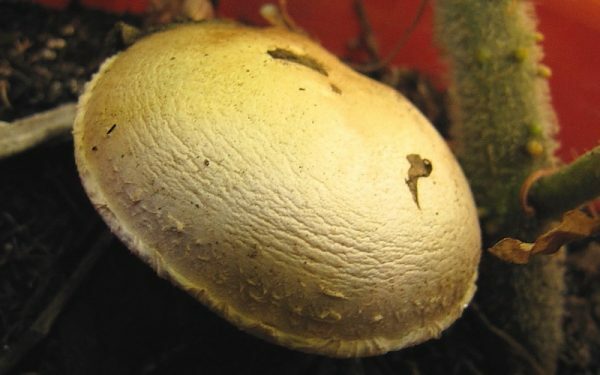 The Banded mottlegill is often found in plant pots and well-fertilised gardens, and often growing amongst the most commonly-grown commercial mushroom, Agaricus bisporus – the latin name encompasses all the various types of common, button, portobello and chestnut mushrooms. No surprise then that I have also found Agaricus bisporus (see below) growing amongst my tomatoes. This only serves to remind us that the traditional substrate for commercial mushroom cultivators is well-rotted horse manure: that is, organic matter that has already well undergone its primary phase of decomposition by passing through the digestive tract of a horse and then left in a heap to “cook” until it has reached a stable state when the other fungi, insects and (possibly pathogenic) bacteria responsible for rotting it down and reducing the nitrogen content have done their job. One species that seemingly doesn’t seem to need to wait for the dung to rot down to quite the same extent is Panaeolus semiovatus, so named because its shiny cap, ranging in colour from pale cream to light brown or beige, resembles half an egg. Shelley Evans and Geoffrey Kibby in their Fungi (Pocket Nature) guide give it the wonderful English common name of Egghead Mottlegill. Like the previously mentioned Banded Mottlegill, the second part of the name refers to the mottled dark grey to black gills underneath its cap. Another of Egghead Mottlegill’s identifying features is the ring around the stem, which distinguishes it from other Panaeolus species. It is not found in woodlands, of course, but in fields and grasslands where horses, cows and other sizeable herbivores freely roam, and is seen sprouting from their digested residue from Spring to late-Autumn. These can range dramatically in size, right up to around 15cm in height, depending on how much of this rich food source is available to them, and for those who don’t mind getting onto their hands and knees amongst the ordure, they make striking photographic subjects.